Make Your Plants Dance With Joy! Maximum light, while still retaining energy efficiency. The sloped roof angle provides for excellent drainage and maximum sunlight. 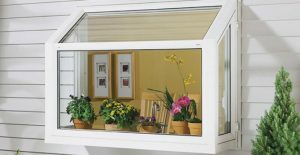 The beauty of the garden window is enhanced by the standard birch or optional oak jamb sill.